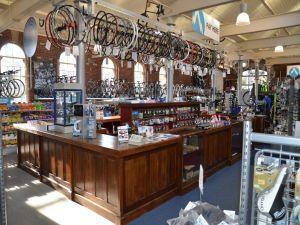 All Terrain Cycles store is one of the largest and best-stocked shops in the country with an extensive range of leading brands from all the various cycling disciplines available to touch, feel and often even try before purchase. You will find over 1,000 bikes in stock at any one time, plus a wide range of clothing, accessories and equipment. The shop is also fitted with the latest state of the art bike fitting facility to ensure that your new bike fits perfectly and there is also a large and busy workshop manned by Cytech trained technicians who are available to advise and help with any repairs, servicing and bike builds needed. Located off Salts Mill Road, to the rear of Salts Mill, under Salts Mill chimney.